Koichi says be sure to check out the resources provided in the supplemental information (See “Conclusions” after the Abstract below). Fig 1. 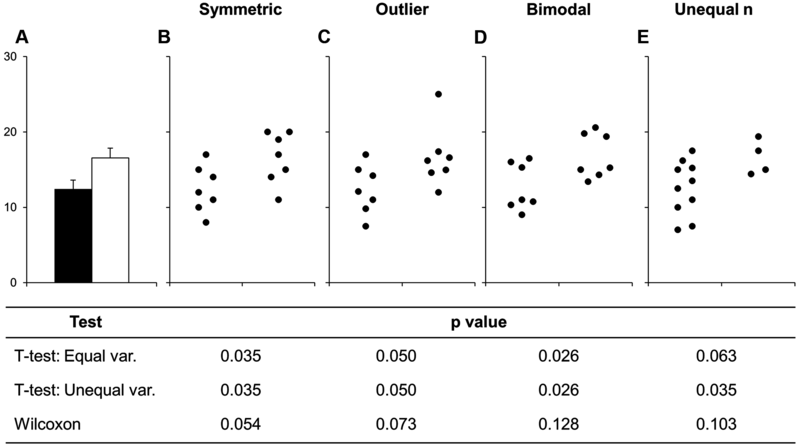 Many different datasets can lead to the same bar graph. Our systematic review identified several critical problems with the presentation of continuous data in small sample size studies. A coordinated effort among investigators, medical journals, and statistics instructors is recommended to address these problems. We created free Excel templates (S2 Text and S3 Text, https://www.ctspedia.org/do/view/CTSpedi​a/TemplateTesting) that will allow researchers to quickly make univariate scatterplots for independent data (with or without overlapping points) and nonindependent data. We hope that improved data presentation practices will enhance authors’, reviewers’, and readers’ understanding of published data by ensuring that publications include the information needed to critically evaluate continuous data in small sample size studies.